5 | 368 students enrolled. 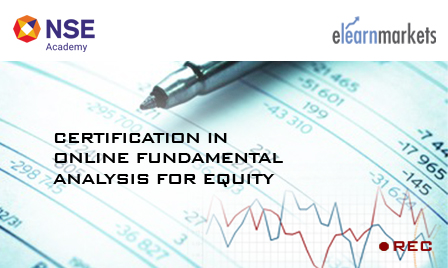 Certification in Online Fundamental Analysis for Equity course is jointly certified by NSE Academy & Elearnmarkets (NSE Academy is a subsidiary of National Stock Exchange of India). Thsi course is a perfectly designed course which provides a foundation for understanding Fundamental Analysis. The course is scientifically structured to help the participants understand basic concepts and terminologies relating to the capital market and their application for investing in stocks. Fundamental Analysis is the backbone of investing. Fundamental analysts study the Balance Sheet, Income Statement and Cash Flow Statement to gain insight on a company's future performance. Students enrolling for this programme will be given a “Certificate of Participation” from NSE Academy facilitated by Elearnmarkets.com, after successful completion of the course. He shall also be given free access to related webinars conducted by Kredent Academy for further knowledge enhancement. An email query support, Question & Answer community platform will also be availed by the student for any kind of doubt clearance related to content while pursuing the course.All the knowledge content is provided by Kredent Academy. This course is skillfully designed to benefit those who are ambitious in becoming successful long term investors and take a non speculative path to create wealth, professionals who would want to learn how to invest, construct & manage individual portfolios and become self sufficient in managing their own money. Individuals at all levels who would want to learn fundamental analysis and analysis beyond valuations are welcomed for the course.